Is biggest always best? Find out in this riotous rhyme with a fold-out finale! Ready, steady – GO! The race is on, and the animals are in it to win it. Rex Rhino roars along in his digger, Charlie Cheetah zooms by in his super-fast motor, and Holly Hornet whizzes right up to the sky in her jet! Whoopee! 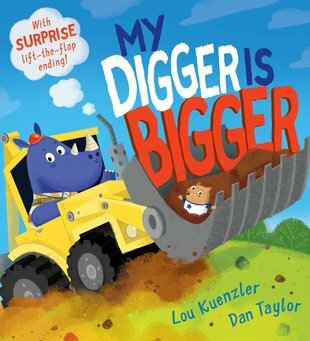 They all think they’ve got the best vehicle – especially Rex Rhino in his huge digger. Little Jack Gerbil isn’t big at all. Nor is his teeny-tiny scooter. But when Jack wows the crowd with his gravity-defying tricks, it looks like small might be best after all! Lou Kuenzler is the best-loved author of Eat Your People!